Live from ISMAR ’08: Is Augmented Reality at Work Better than Reality Itself ? Bruce Thomas introduces the afternoon session at ISMAR ’08 focusing on user studies in industrial augmented reality. First is Johannes Tuemler which will talk about Mobile Augmented Reality in Industrial Applications: Approaches for Solution of User-Related Issues. The study looks at psychological and ergonomic factors in augmented reality usage and create a requirements catalog for mobile AR assistance systems in diverse scenarios. This was a collaboration with Volkswagen, Ergonomics department in Ott-von-Wolfsburg, Perception Psychology from Weymar University, and Information technology by the Fraunhofer Institute. The reference scenario chosen was “AR picking”, where subjects would work for a couple of hours of picking items from shelves using a mobile AR device. The users reported no rise of stress level with an AR system compared with no AR (except for some visual discomfort). Since the AR system was less than optimal, the research may point to the fact that with a better AR system the stress level of workers – compared with no AR system – could be reduced! As a direct follow up to the first study, Bjoern Schwerdtfeger comes on stage to describe the results of an Order Picking with AR work. Traditionally the system includes a print out with instructions of what items to pick from bins on shelving. How can an AR system help improve the performance of such an activity? They looked at mulitple visualization options: Frame tunnel, Rings tunnel, and 3D Arrow. The results showed that the frame visualization was more efficient than the arrow. It’s not clear whether the rings visualization is superior. Final speaker for this session is Gerhard Schall from Graz University to discuss Virtual Redlining for Civil Engineering in Real Environments. What is virtual redlining? Virtually annotation paper maps or 2d digital information systems (mostly for the utility sector). This process helps significantly in the workflows associated with network planning or inspection. The process involved mapping of 2D geographical data with 3D models of buildings and underground infrastructure. The tool developed allows for collaboration, inspection, and annotation. 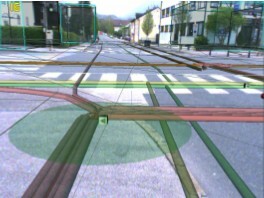 Results of the usage study confirms that the AR system has significant advantage in civil engineering – in this redlining scenario. The color coding was important, as well as the digital terrain model. Question from the audience: where do you get the 3D modeling of the piping? Answer: Some utility companies have started to map the underground infrastructure. But in most cases we create it based on 2D maps which is only an approximation. And that concludes the Industrial user studies session. See you next at the last session of the event: Rendering and Scene Acquisition, leading to the grand finale with the award ceremony for the winner of the Tracking Competition. finally i find something that i want to know..